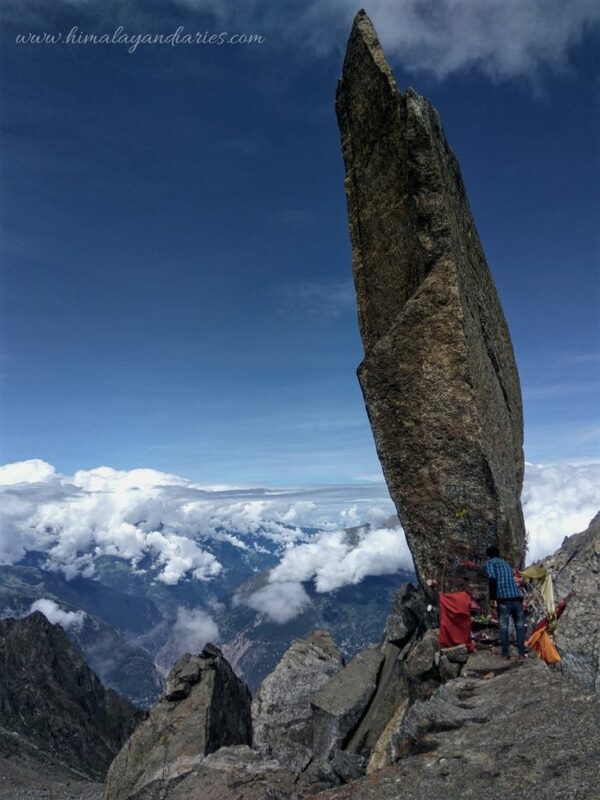 Climbing Kinner Kailash. My Quest for redemption. It was a bright summer morning. The sound of the Parvati River was roaring like always. I quite liked the sound of the river. Kasol was ready for a new day. The place usually gets up late, due to the late night culture here. In the early nineties, young Israeli men and women, who were just out of compulsory Army service would come up here and spend a few days in peace and tranquility. This place suited them as here things were easily affordablewith the stipend they received at the end of their service. By the turn of the century It became a popular Israeli joint with most of the locals learning the hebrew way of life. The natives here learnt catering to these guys, who did not expect much. All they wanted was a transition phase from the super tough compulsory military service back home. Soon the place was flooded with reggie cafes, joints and bakeries catering to their needs. In fact nothing was written in English and Hindi, everything was in Hebrew script. The Parvati area has always been a hub of Marijauna production. The climate and the water from the streams has always been conducive for it’s production. The easy access to which made life more easier for these foreigners. 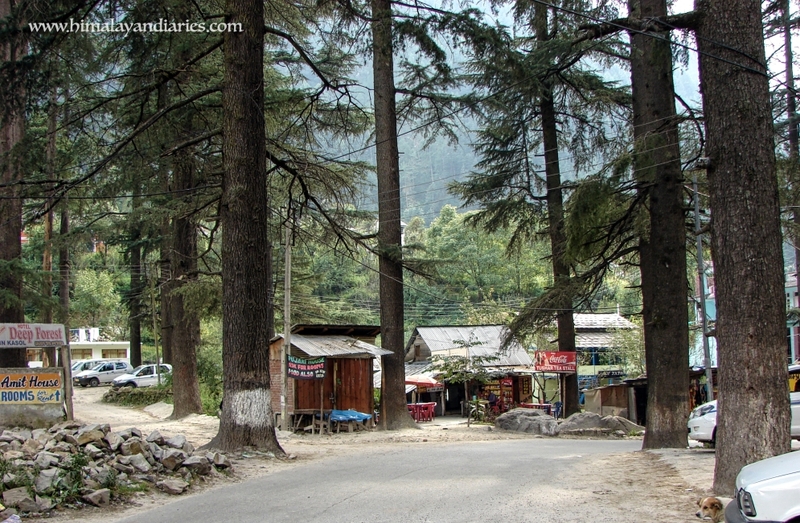 So Kasol became a stress detoxing centre for the few who knew about it. Life was simple here. Most of the outside world did not know about this place. In around 2005, Domestic tourism stared to flourish. Manali became a household name. Rohtang became the easiest prey for a selfie crazy SUV owner. 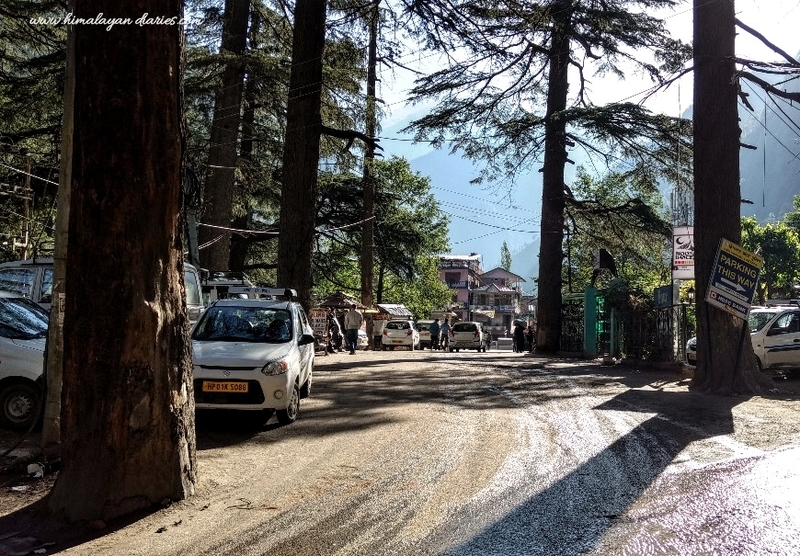 The crowds started getting into the main Beas Valley, as it had Manali and it was the starting point of the road journey to Ladakh. 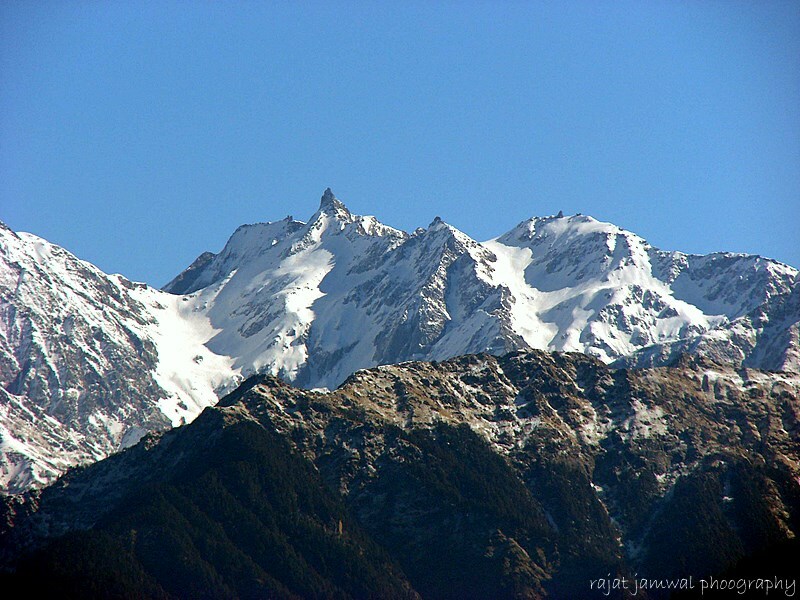 This was the first time Domestic travelers were introduced to the Parvati Valley. Although Sikh on pilgrimage always crossed this place while visiting a place nearby called Manikaran. So enter the amazing North Indian crowd to this place and yes with loads in their pockets . It was certainly fascinating. No way were these people ever exposed to such open and different culture in their lives. Soon the bars, cafes and joints were invaded by these people, and by the years the Israelis left Kasol to find solace in the villages higher up the Parvati stream. So Moon dance cafe was now is an all Indian affair. So lets back to the story, It was a bright summer morning and as usual the River Parvati roared. I had come back to this place after 20 years. It was way back in 1997, I was here for a trek across the Pin Parvati Pass, which crosses over to Spiti. Well, those were different years. I will only talk about today. Well, it was all about joints, weed, and chillums here. Everyone seemed to me to be a master of the trade here. Anyone could roll anywhere, and weed was available almost anywhere. You could get many varieties of weed here, from the most common one to the glamorous Malana cream. You could openly smoke in any of the bars, cafes, guest houses or for that matter anywhere. The place looked young and certainly there was a lot of buzz around the market place. Actually my story starts here. I saw a group of young boys rolling a joint. They were all very involved, no one seemed to be distracted as I took a seat next to them. Eventually after the rolling and jolling, it was time to light the joint up. As one of them ignited the rolled joint, all of them said Jai shiv Shankar. The joint exchanged hands after long puffs. Everyone looked happy and satisfied. The usual chants of Jai Bhole and Jai shiv Shankar were on in between. Well now what does Lord Shiva have to do with all this. Now whom to ask. Well a conversation started and I got my answer “This is lord Shiva’s Prasad”. So I learnt an important lesson that day, drive down to Kasol with loads in your pocket, roll a joint and be a Shiva devotee. In fact if you happen to be in the bazars of Kasol there are lots of Lord shiva merchandise, like T shirts, lockets, bags, kurtas and to add a few Shiva cafes. A whole generation of clueless people, smoking weed here only to find solace and disorienting their minds thinking they are devotees of lord Shiva. But the mind is always on the move. Who is Shiva? Many stories and legends surround this most prominent figure of Indian spiritual traditions. Is he a god? Or a myth constructed from Hindu culture’s collective imagination? Or is there a deeper meaning to Shiva, revealed only to those who seek? I was born and brought up in a small village overlooking the Satlej in the Kotgarh region. Kotgarh lies in the upper reaches of Shimla hills. The area is more famous for apples, but I always thought it was more then apples here. The way of life, simple and straight, the work culture, which was very strong when I was a small child. My grandparents always made sure that we as kids had some time devoted to the farm work. It could be small tasks like feeding the grass to the cows or maybe cleaning up the leaves near the house. Evenings came quickly, and they were spent around the fire place, where my grandma would cook the simplest of meals, with the sounds of the local radio station playing Kinnaur songs in the background. Mornings were bright and lively with lots of activity in the farm. I always got up to the views of Snow clad mountains from my room window. It almost became a habit to get up everyday to get up and stare at the mountains. I kept looking at them for hours. I would look at the rough ridge lines and the sharp contrast these summits had with the blue skies. There were many summits which stood out prominently. One was towards the south eastern direction which consisted of two major peaks, one of which looked broken from the top. Elders in my village called them Paap Punya. Punya was obviously the one which was broken. So according to the elders in older times Punya peak was higher then Paap, but as over the years Paap in the world increased the Paap peak become higher. Now don’t take my words for Geological implications, I am just saying what I heard from the village elders. There were two other peaks which were prominent , one in the most left corner towards the NE from my house, and the other one more straight. They were like pointed tips on the entire Ridgeline. 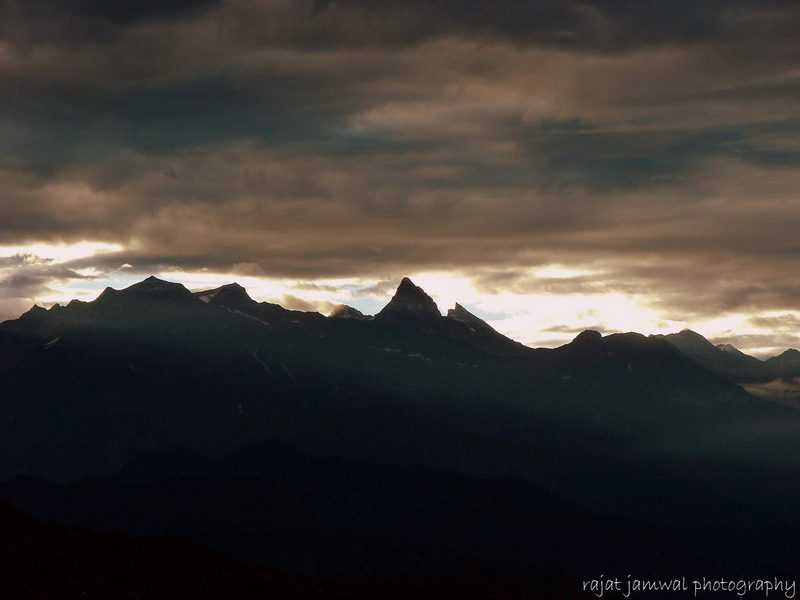 The one towards the NE is the Shrikhand Mahadev peak and the other one is the Kinner kailash. So what was so important about them. Grandma said “ Kailash is the abode of Lord shiva”. If shiv has a home on earth it has to be on Kailash. She told me that the real Kailash is at Mansarovar, from where this Satlej river flows. It’s here only behind Shipki la, beyond Kinnaur. Well more interaction and I was sure that the two Kaislash tops are the abode of Shiva. 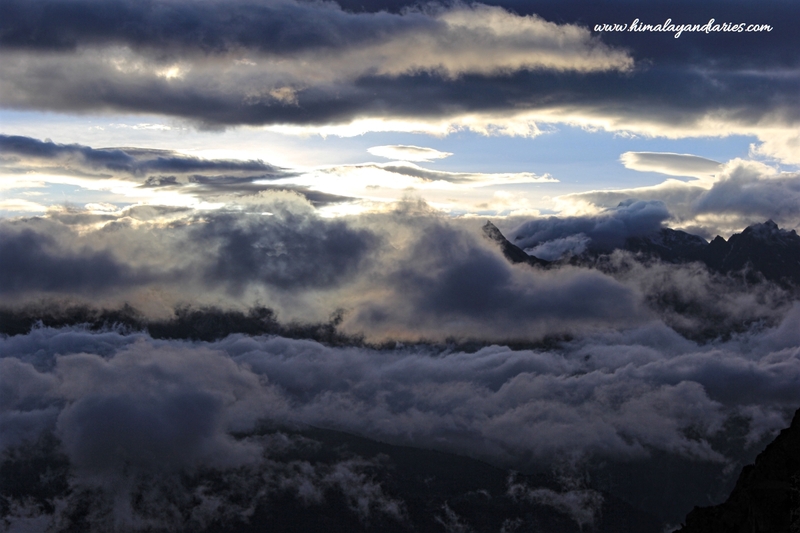 Now I was a kid of around ten years, and going to the Kailash was not easy for me at this time. I used to meet people who came back from Shrikhand Mahadev. They told me their tales. I would listen to what ever they would have to say. One man said he took 20 Baturus, and they all finished in two days, and they were hungry after that. Baturu is a fluffy Himachali Bread prepared using Yeast. I was surprised how can a man have 20 Baturus in two days. Well, small bits of information kept coming in, and all of it, I used to record in my brain. Years passed by, and my quest for Shiva was on. It was a relatively cold morning. I quickly folded my sleeping bag into my rucksack. As we were carrying water as it was not available at the Caves, I did not want to waste it by washing my face. I just threw a handful on to my eyes, so that just could get that tinge of freshness. We were at the caves, which serves as a night halt for going to Kinner Kailash. We had walked about 9 Hours yesterday from Powari near the Satlej, which was all a climb. I was quite fresh. 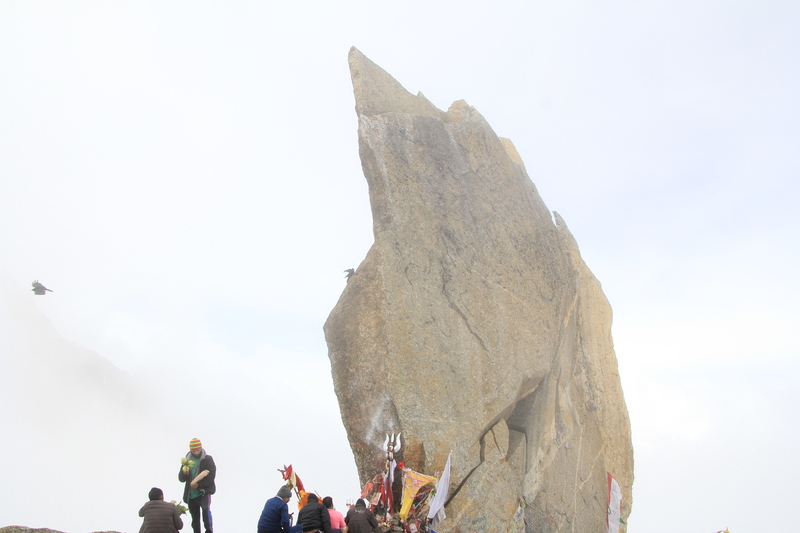 More was the excitement of being near the Shivling on top. I had already been to Shrikhand Mahadev before, but this seemed to be more challenging. We started to walk and there was a well defined path, and we were well into the as I put it in Kinnaur “Bhramkamal Zone” . Bhramkamal is a flower which blooms in high altitude around 3800 m to 4300 m. This flower has significant religious relevance in hindu mythology. Then suddenly a huge moraine appeared, huge rocks everywhere, but they were cairn put everywhere, so we could make out our way. It became tougher and tougher, and after some time we reached a place where the Moraine become relatively flat. Here there was a small water body, which is called Parvati Kund. The place is strewn with huge boulders, and you have to keep hopping over them to cross over, and yes you must be always looking at the Cairns. Cairns are a pile of stones that are made to mark a location on the route. 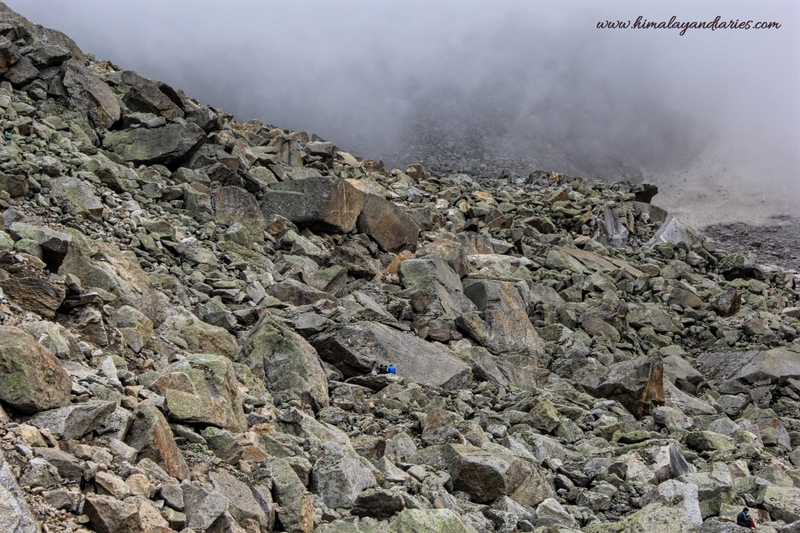 The final climb from Parvati Kund was almost vertical, and I was using both my hands to cling on to the boulders. Slowly and steadily we moved on, and we were on the ridge, and I could see the other side. Kinner Kailash was in front on me, I could feel the vibes in my body. How does one reach here, It was such a difficult climb, but it seemed so easy for me. 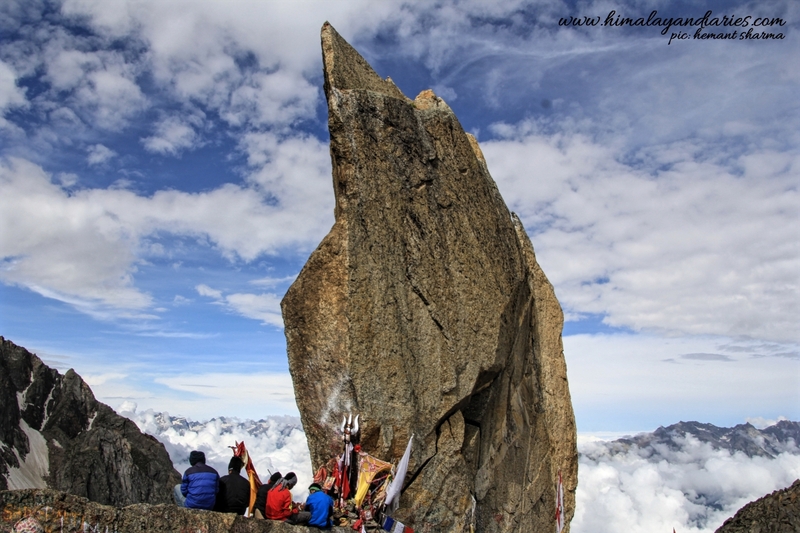 A human is so frail and small in front of these huge mountains, but still he makes it to the top, to the abode of Shiva. This is shiva, the power of him, who makes you realise, that you are pure and supreme. Only you have to be honest and dedicated, You can achieve anything. The stone was stuck to the top of the mountain, and has remained there since mankind remembers, and will remain there till eternity. I bowed down in prayer, towards the holy rock, and closed my eyes, again I saw I light which seemed to get brighter. It was certainly the abode of Shiva. The basis of existence and the fundamental quality of the cosmos is vast nothingness. How much area does the galaxies occupy. The rest is all vast empty space, which is referred to as Shiva. That is the womb from which everything is born, and that is the oblivion into which everything is sucked back. Everything comes from Shiva and goes back to Shiva. I met and understood My Lord Shiva here. The two birds which locals beleive is very auspicious.